They say a picture is worth a thousand words, and this picture postcard does indeed tell its own story. 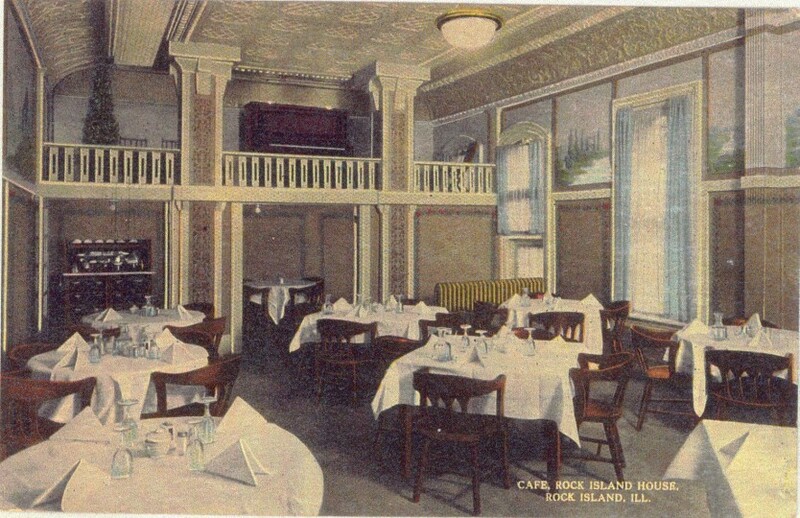 The postcard from Shannon Hall’s collection shows the small café in the Rock Island House hotel as it appeared after 1910. Because such postcards with interior views are uncommon, they imply a special pride in the subject by the owner and the postcard-purchasing community. The Rock Island House, at the northwest corner of West 17th Street and Second Avenue, was the subject of a previous Postcards from Home story on June 20, 2004. The hotel operated from 1837 until 1922, undergoing enlargement and remodeling several times. The Argus reported one such “refurbishing” in 1910. The plans called for all new equipment and furniture for the café, except for the tables and chairs. The walls were to be frescoed and, although the postcard doesn’t show them, there would be individual lights at each table. Service was going to be “up-to-date” as well. Lowering of the ground floor level in the hotel was also planned, to make the lobby level with the sidewalk. Installation of ornamental “post lights” in front of the hotel was a finishing touch. The term “fresco” can simply mean that the plaster is tinted with color before it is fully dry. But it often means much more. On the Rock Island House café walls, the postcard shows a wide frieze with a painted scene that appears to feature water and cone-shaped evergreens. This painting may have been the work of artist Frank Lundahl, who was born in Rock Island in 1858 and later lived in Moline. Several years earlier, Lundahl had created scenic paintings on the walls of Rock Island’s Hotel Harms. The Rock Island House had four main “bays” or storefronts fronting on Second Avenue. 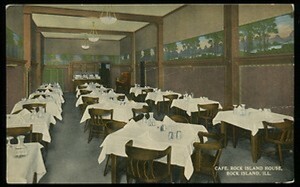 The lobby was at the far east while dining areas, including this café, were located at the western portion of the building. Sanborn maps from 1912 show the large “dining room,” with a kitchen behind it, at the westernmost storefront joined through a doorway to the smaller “café” at its east. A 1915 photograph of the hotel shows a CAFÉ sign at the west entrance. The café was also accessible from the hotel lobby. The postcard shows a window at the far right which opened into the lobby rather than to outside. Beyond the window is another smaller window with a stairway and door beneath it, indicating the lobby is at a lower level. The window hangings are layered in a modern manner, with open draperies covering semi-sheer panels underneath. Ornately embossed painted metal in a square design covers the center of the ceiling, while the edges are trimmed with deeply coved metal. A single half-dome ceiling light can be seen. Below the painted frieze, drab-colored wall panels are decorated with a stenciled border. Similar stenciling outlines the large square columns, which have massive capitals built up with layers of wood trim, that support a small balcony at the far end of the cafe. The balcony, enclosed by a railing with flat balusters sawn with a rectangular pattern, holds an upright piano at its center and what appears to be a tall evergreen, perhaps a Christmas tree, at the left. Entertainment may have been a regular feature at the café. Under the balcony, a service buffet is visible. Round tables are placed around the edges of the room, while square ones parade down the center. Sturdy chairs have a comfortable barrel-shaped back. All of the tables are draped in square white tablecloths and are set for four. A napkin, neatly folded in a steeple, and an inverted goblet marks each place. No silverware is present. Equipment for common use includes a bulbous glass water carafe, white sugar bowl and salt and pepper shakers. Thus the scene is set. More words could be said, but you will have to say them yourself, considering the families, the food, the festivities and more. Let this postcard picture speak to you more clearly than a mere thousand words ever could. This article by Diane Oestreich is slightly modified from the original, which appeared in the Rock Island Argus and Moline Dispatch on March 17, 2004.